Fawad last played for Australia six years ago. Australia leg-spinner Fawad Ahmed has decided to retire from first-class cricket in a bid for World Cup selection. He is very much optimistic about his selection in the Australian team for the mega-event and won’t be available for his state team Victoria for the remainder of the Sheffield Shield season. He has informed the team accordingly and is now hoping to give his best in the limited-overs format to earn a national recall. “I’m a cricket ’nuffie’ so it was pretty hard for me. I love four-day cricket. The way I train and the way I love the game – I have spent hours and hours in the nets and enjoyed my time both on the field and off the field. It was a very tough decision, but that was the (best) available option and that was the future looks like. There is an end for everything. I still love the game – one-day, T20 or four-day cricket – but for me, the only available option was white-ball cricket so I’m going to continue to play 50-overs and T20,” he told cricket.com.au. 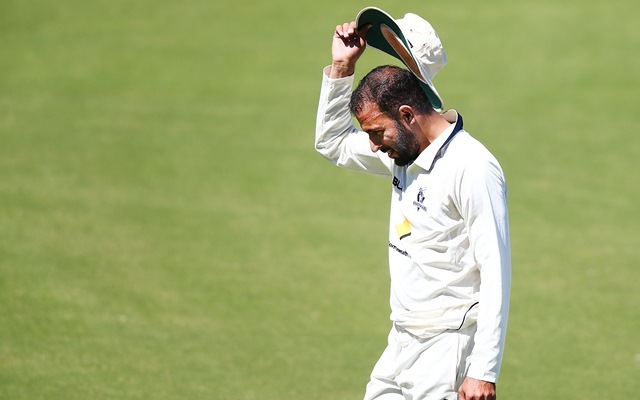 As far as Fawad Ahmed’s first-class career is concerned, the leggie has featured in 62 matches for his state Victoria picking 205 wickets at an average of 31.11. He accounted for nine five-wicket hauls during his time with the red ball. Even as he is eyeing a World Cup spot in Australia squad for World Cup, Fawad doesn’t boast of a great record in the yellow jersey. He has played only 3 ODIs for his country accounting for just three scalps and was last seen playing for Australia in 2013 against England in Southampton. Recently, his selection debate came up after a brilliant performance for Sydney Thunder in the ongoing Big Bash League (BBL). It will be interesting to see if the selectors consider him for the mega event in England and most importantly, Fawad is not the part of the touring party to India.